The little miss is doing summer camp! How ridiculously cute!? We were lucky enough to find a few 4 year old programs and I think she will love the new friends and fun activities. While her camp will be full of arts and crafts and sports, Digital Media Academy is offering teens a place to learn computer programming, app development, 3D modeling, robotics, graphic design, filmmaking, and much more. My favorite program is the new Made by Girls, a new program dedicated to empowering girls and closing the gender gap in the tech industry. I love when programs center around girls improving and empowering themselves! 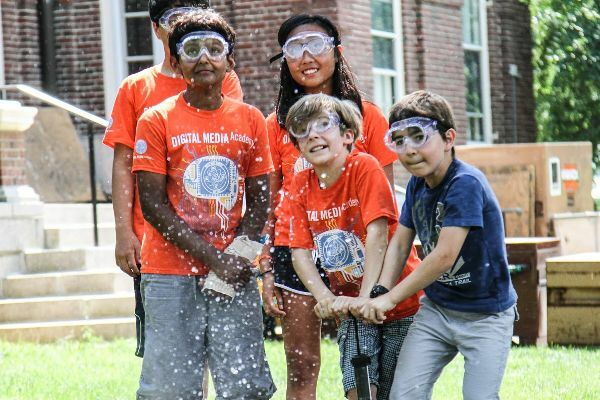 As before, you can still save $75 off summer camps at Digital Media Academy with code TECHSUMMER at www.DigitalMediaAcademy.org. Sign up for multiple weeks and save big! Campers save $125 for each additional course they register for. Register by June 30th to #CreateTheNext best-selling app this summer! Questions? Call 1(866)656-3342 to speak with a Guest Service Representative or email info@digitalmediaacademy.org and mention the US Family Guide Special Offer. 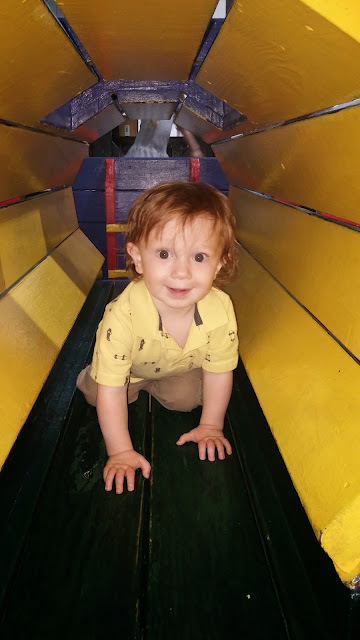 Little Man is One Year Old! Blogging in April was almost nonexistent. Between observations at work, the last couple weeks of my grad program, and just a general oberwhelm... I needed a break front writing. But I'm back and the little guy is already one! 30 1/2 inches and 19 lb 14 oz. Can we talk about how tall he is?! Yikes! He's got some gorgeous red curls going on! I'm still trying to hold off on his hair cut but that may not happen. 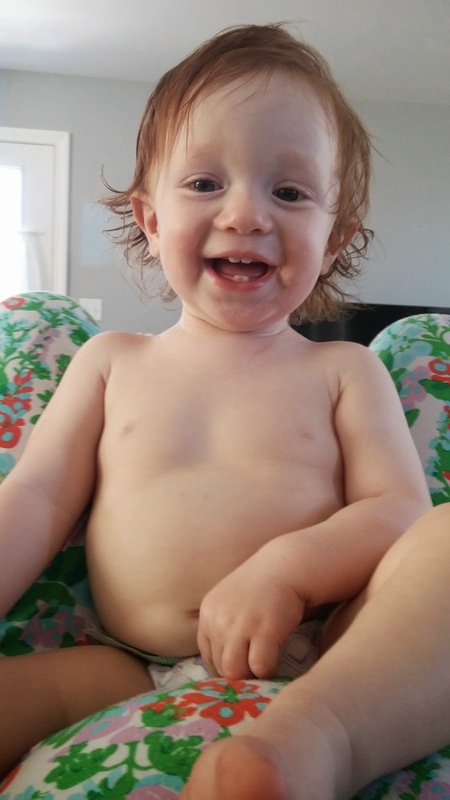 He has 4 teeth and a bunch of gummy smiles. He also does this super coy thing where he looks down at the floor when he's acting shy. Way too cute. We are fully walking unsupproted now! The first couple steps happened the day before Easter and now he flies the through the house. 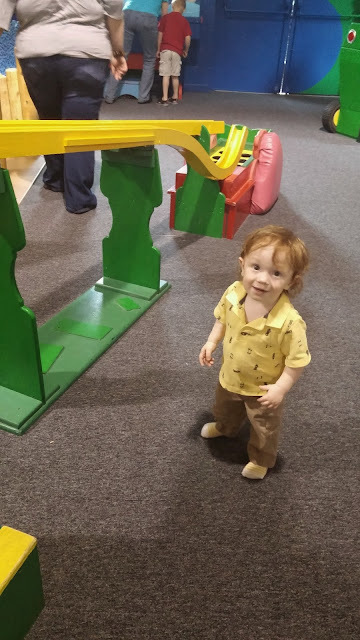 He will soemtimes drop to his knees so he can move faster, or uses his activity walker (or a chair) to zoom around, but loves just walking unsupported! Some nights are awesome, and some nights are not. He likes to fall asleep around 7:30 at night and is always wide awake by 6:15 am, whether or not there are middle of the night wake ups. He only sleeps on his side or belly and will still roll himself if you try and put him any other way. We are still nursing but I stopped pumping when I got back from Las Vegas so we've been doing bottles of half frozen milk and half formula while I'm at work. Hopefully we can stretch the frozen milk out until we transition entirely. Otherwise, he LOVES scrambled eggs, any Gerber baby finger foods, french fries, vegetables like corn, peas, and green beans, and all kinds of meat including chicken, hamburger, and turkey! I'm always amazed at how much he can eat! We made some home made deconstructed chicken pot pie and he polished off 3 (baby sized)plates! He's making lots of consonant sounds like Bah, Dah, Mmmm, and Wah. "Mom is the only read word we can hear but he's getting there. Any electronics, especially phones and remotes. And he's not silly enough to use fake ones-- only mom and dad's will do! The little guy shakes it! Both back and forth and up and down, I just laugh so much when he dances! He also really loves the animals lately giving big open mouth kisses on their backs! The dancing has got to be my favorite this month. He gets so into it and will just yell and shake around when any music plays, including just me singing! He gives kisses if you ask for them, right on your mouth... and it's adorable. Also, the way he yawns and snuggles on to my shoulder when he's tired. My big thing was that I was going to make all of the Princess' food from scratch, using only organic produce. And then Dave lost his job and I was lucky to get a shower in some days so we went right to baby-led weaning and never even considered jarred food. With the Little Man, we both had good jobs, better schedules and I thought this would be my chance to make his delicious, organic, homemade pureed foods. Then I was just too busy. Things get crazy and some nights I was lucky to get dinner on the table by 6 pm, never mind having time to make homemade purees for the Little Man. Thankfully, Beech-Nut has introduced a new line of Organic purees so I can feel good giving my little man jarred food! It's nutritious and tasty without any artificial preservatives or ingredients. It's not just store bought baby food, it's real food that I would cook for my little guy with the convenience of not spending the time making it! 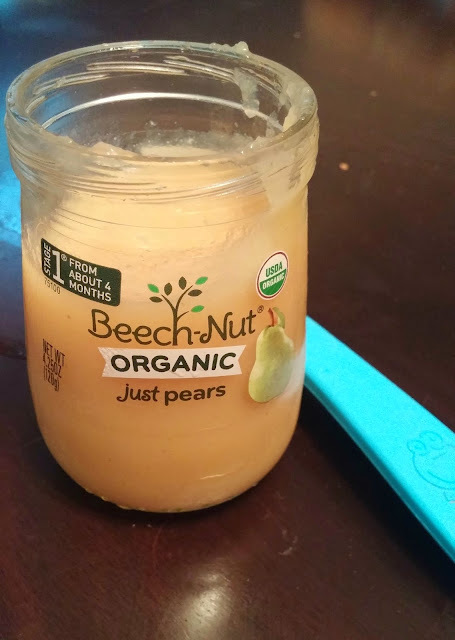 Beech-Nut's new organic line can be found at places like Babies R Us, Kroger, Wegman's, Price Chopper, Wakefern, Walmart.com, Winn-Dixie, BI-LO, Stop & Shop, Giant Carlisle, A&P, Pathmark, Albertsons, Hannaford, Raley’s, Meijer, Nugget Market, Diapers.com, Harris Teeter, Shaw's, ACME, Shoppers Food and Cub Foods. A full list of retailers can be found here if you're looking for some local to you! At our trip to Babies R Us, we grabbed lots of fruits! 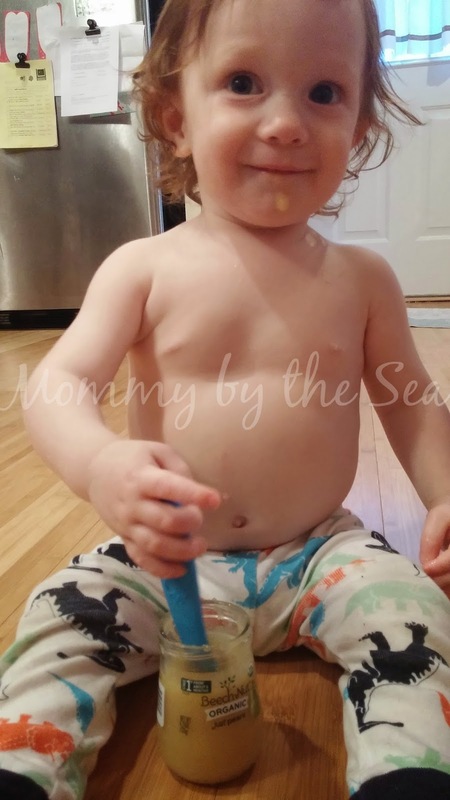 We eat veggies with dinner every night but I often find our fruit selection is lacking so adding Beech-Nut Organic fruits as a snack for little man is perfect for us. We grabbed a couple of "Just Pears" but they also had flavors like organic apple, raspberry & avocado, organic banana, cinnamon & granola and organic butternut squash, and black bean & cumin. The foods are made by Beech-Nut just like I would make them, with nothing else except for pears! There are no extra preservatives or excess water and the nutrients stay in the fruits and veggies for a delicious and nutritious snack! You can even see the USDA-certified organic seal right on the jar, which is an indication of GMO-free food! Beech-Nut was even awarded Product of the Year in the baby category, which was selected by over 40,000 consumers nationwide! I love that there is #RealFoodForBabies that is healthy, organic, and I can feel good about giving it to my Little Man. He clearly loves it too! You can find Beech-Nut on Facebook, Twitter, Instagram, and Pinterest. And Beech-Nut is being super amazing and giving away a coupon for your choice of a FREE Beech-Nut product! Just leave a comment below as your entry! I'll choose a winner on 5/21 at 5 pm EST! You'll have 24 hours to respond if you win! Tell me : Why do YOU choose Organic? "Contest entrants are only eligible to win once per sweepstake, per household as part of a campaign sponsored by Influence Central and must reside in the United States." 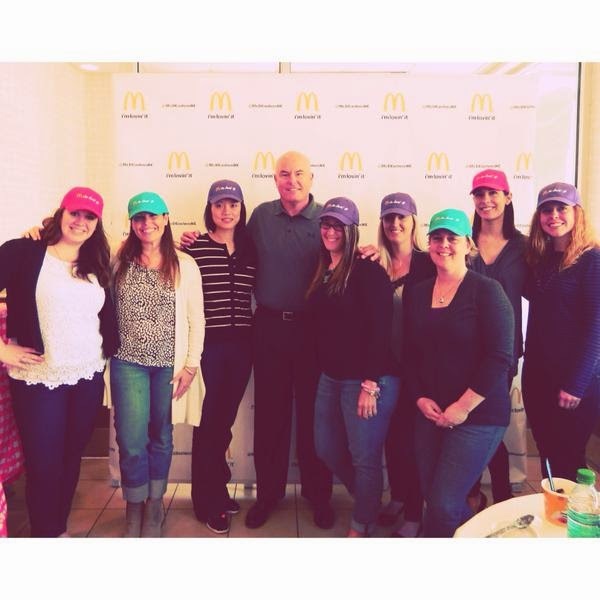 Disclaimer: I was invited to attend a McDonald's Open-Door Tour and received compensation for this post. All thoughts and opinions are my own! I totally have your attention now don't I?! You can lose weight while ONLY eating McDonald's! I was a little leery of it when I heard as well, but was so excited to be invited to take a behind the scenes tour of a local McDonalds, that I jumped at the chance! My toddler loves "Old McDonald's" but with rumors of pink slime and meat patties that don't grow mold after 5 years, I've been apprehensive about bringing her. Imagine my surprise when we walk into the kitchen and see fresh eggs being cracked on the grill! It's so cool! 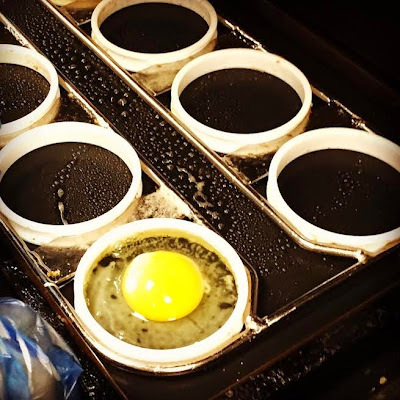 I had no idea-- I really thought the eggs were the frozen pre-made eggs but that was not the case! Did you know you can even get egg whites? Yum! 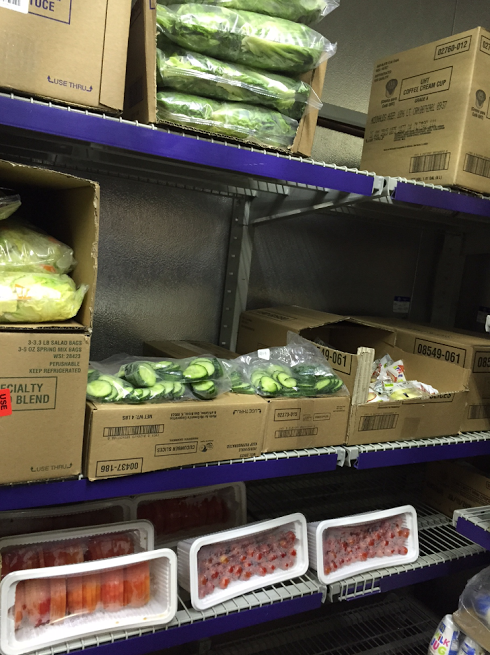 After working in a sit down restaurant for 5 years, I was even more excited to see the supplier of the fresh produce was the same that used to deliver to Friendly's! Those are fresh, no preservative vegetables! Even the fridge set up shows that they are totally on par with their food handling skills, following FIFO (First In, First out) and shelving guidelines! Additionally, we were told (and saw the packaging!) about the amaing companies who supply food for McDonalds: Dannon, McCain, Tyson, General Mills-- all brands I already trust inside my house! I was already feeling so much better about bringing my little ones to a McDonald's for a meal. There's such a stigma about fast food and how bad and unhealthy it is, but that didn't seem to be the case. All of the food was fresh and healthy! One might even venture to say that you could lose weight while eating it? Gasp! Enter John Cisna! Never heard of him? He was on the news a couple nights ago... google that! He is a Science teacher from Iowa who was concerned about the results he saw in the movie Supersize Me. Of course, if the guy from Supersize Me was eating 3,000 calorie meals, he was going to gain weight! John wanted to see if it was possible to lose weight. He got his students in on the project, using the McDonald's Meal Builder tool, and they came up with over 50 combinations of daily meals that could be consumed that were under 2,000 calories and satisfied the FDA's 15 required nutrients guidelines! Okay, well, except for salt. But he compensated for the extra salt but adding more water to his diet to flush out the excess. A normal day of eating for John would consist of 2 egg white delight sandwiches, fruit and maple oatmeal, and milk for breakfast, a Southwest Salad with a yogurt parfait and apple slices for lunch, and a meal off the value menu-- including french fries! Oh, his workout regimen? 45 minutes of walking. That's it. Totally doable. He lost 37 pounds, 7 inches off his waist, and dropped his cholesterol from 249 to 170! Yikes! And then John said "But this was an experiment, not a diet." It was done to teach critical thinking skills, and as a teacher, I loved that aspect of it. He wanted his students to not just believe what was told to them, but to think for themselves and to make decisions based on what they know is best. This whole experiment proves that you make your own choices. 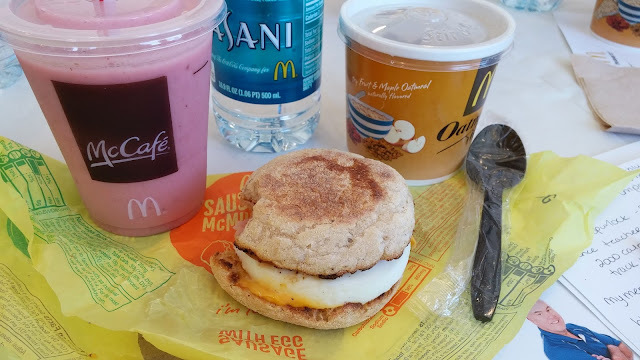 This is an 800 calorie breakfast but I didn't finish a single item-- only sampled!-- but even if I had, it would just mean I'd need to scale back my lunch a bit! McDonald's does not make people fat or unhealthy; the decisions people make while ordering McDonald's, or anywhere else, are what make them unhealthy or overweight. Making conscious decisions about what we put into our bodies is important, and after seeing the quality of what McDonald's is using in their kitchens, I won't feel guilty anymore about picking up drive thru or taking the princess out to celebrate! 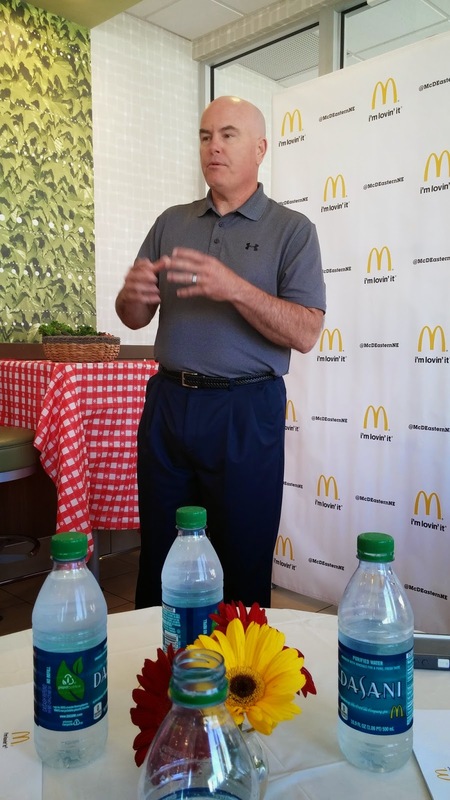 After visiting McDonald's and meeting John Cisna, I can can say it: I'm lovin' it. 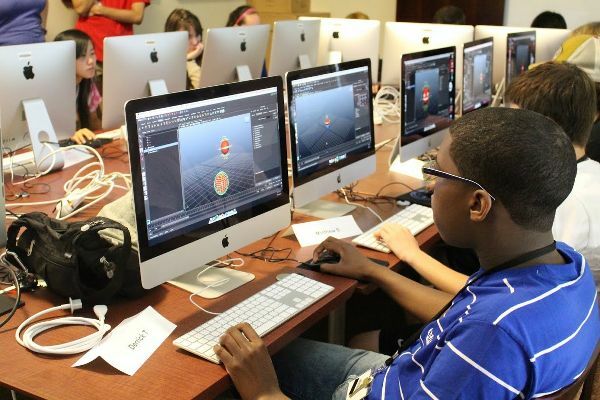 Save $75 on Digital Media Academy Summer Camp! Disclaimer: I received compensation for this post, however all words and opinions are my own. Coding and digital media are huge and will only continue to grow. 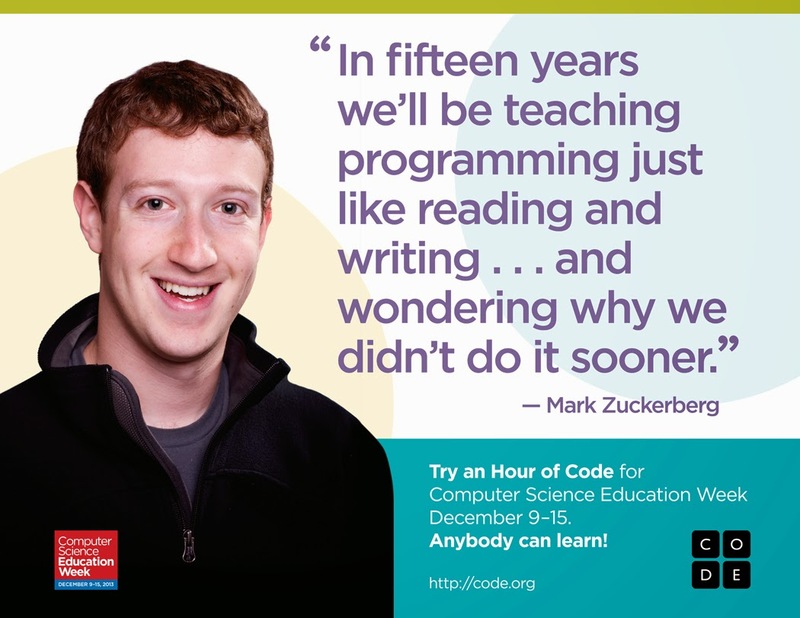 Thankfully Digital Media Academy gives your young ones a place to learn computer programming, app development, 3D modeling, robotics, graphic design, filmmaking, and much more! And what kid wouldn't love summer camp where they get to "play" with electronics-- don't worry, I won't tell them that they're learning! And if you use the code TECHSUMMER, you will save $75! If you register for multiple weeks, you will save $125 off of each additional week! So now the question is... what app is your kid going to create?! Head to Digital Media Academy now and sign up for an awesome summer! Something New : Save Some Money with Yipit! 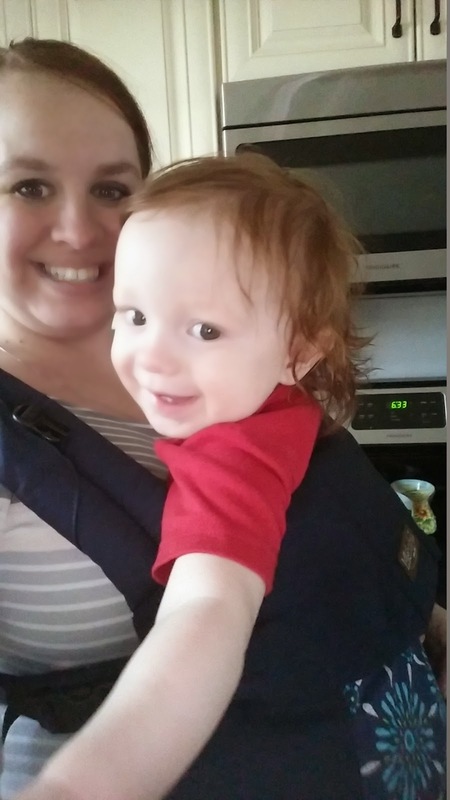 I've constantly thought about adding a coupon piece to the blog; a discount piece that will help other mamas, and not mamas, get great deals because I love a good deal too! But coupon blogs take up your entire life. I have no idea how some of my blogger friends update coupon blogs as much as they do! I've seen upwards of 15 posts in a single day! It's just too much for me! Thankfully I have a few friends over at Yipit and they want to help me out. Once a month, the gorgeous people will send me a few awesome deals to share with you! They have promised me both nationwide deals and then some area specific ones tailored to you! I'm so excited to start sharing these great deals with you!